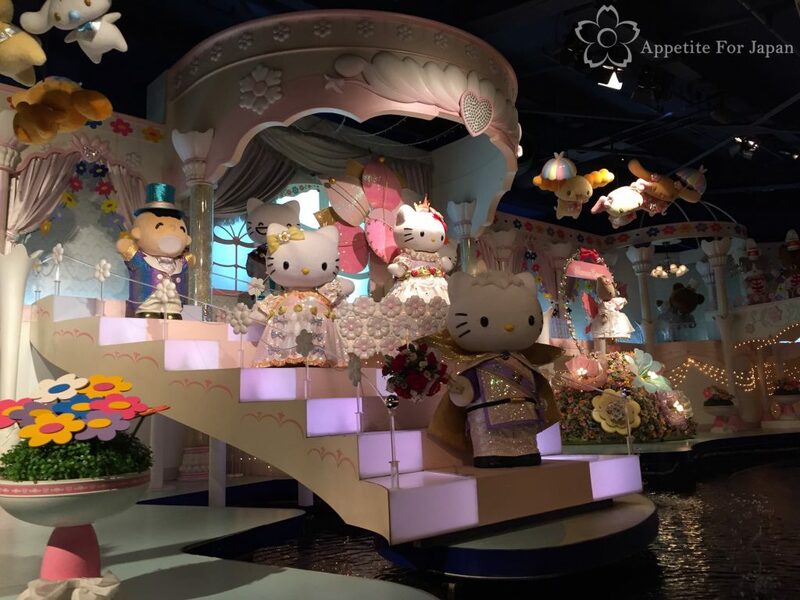 Sanrio Puroland (サンリオピューロランド – or as I mistakenly called it for a while, Hello Kittyland!) is located in the Tokyo suburb of Tama. 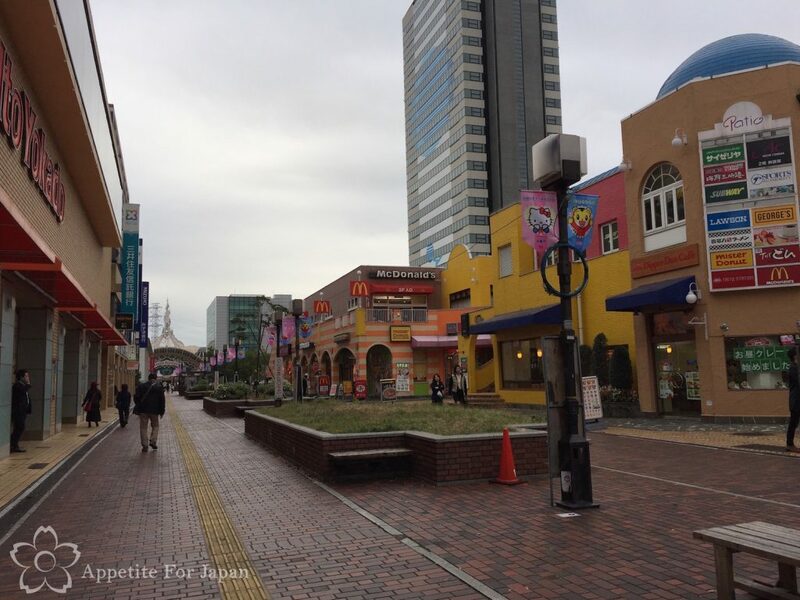 Tama (多摩市), and specifically Tama Center (多摩センター) where the theme park is found, is about half an hour from Shinjuku on a semi-express train, so this is very much in the suburbs of Tokyo as opposed to the centre of the city. After a night in the amazing Hello Kitty themed hotel room at Keio Plaza Shinjuku, my partner and I headed off to Tama for the afternoon. 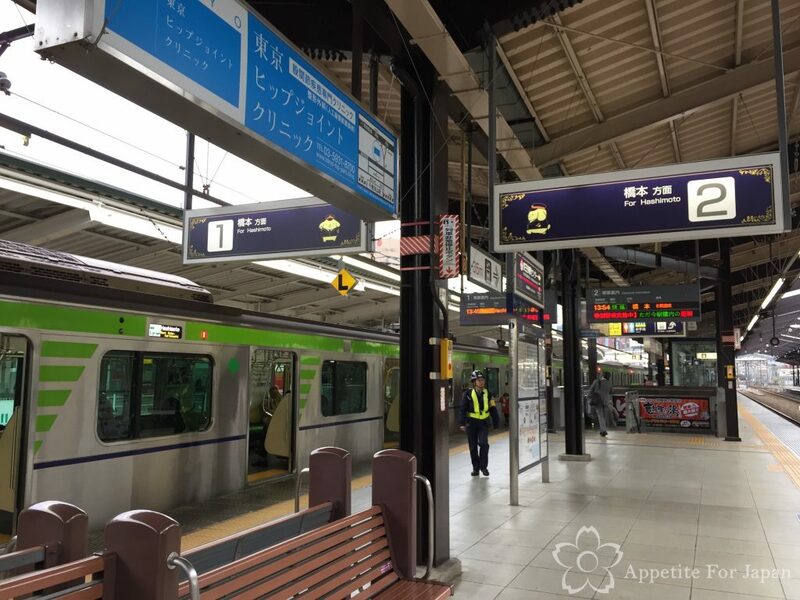 Catching the train to Sanrio Puroland is all part of the fun, and one of the first things you’ll notice when you step off the train is that the station is decked out Sanrio-style! 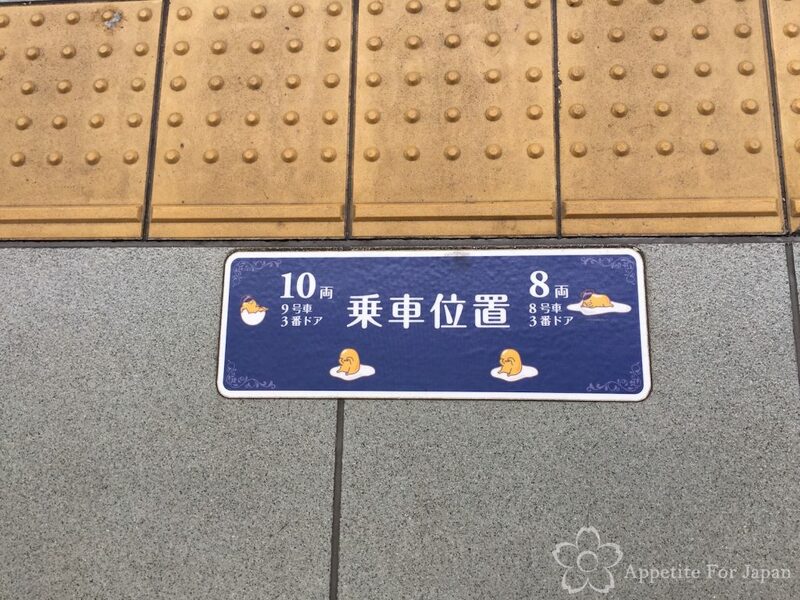 The notices printed on the platform feature various Sanrio characters, such as Gudetama (pictured above). Above: Checking the signs to make sure you’re on the right platform? You’ll see Pompompurin there too! 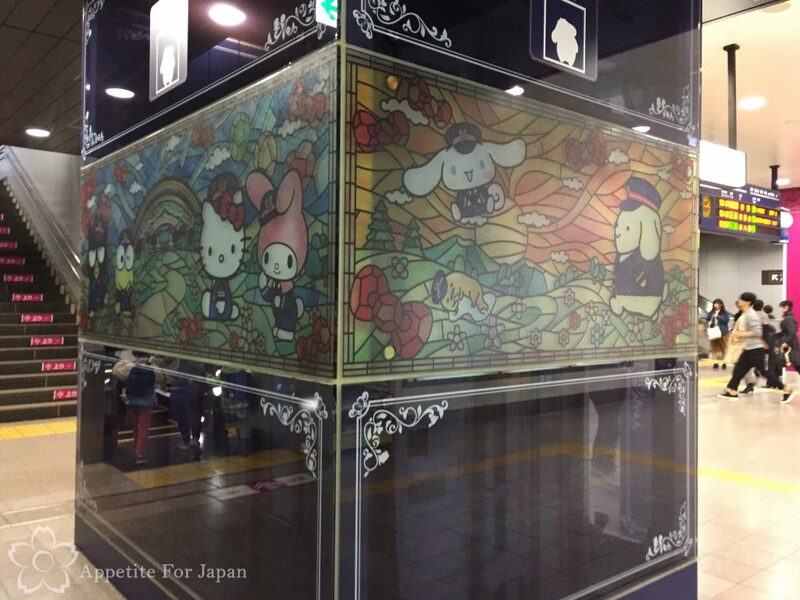 Above: The outside of a lift (elevator, for my American readers) features a whole lot of well-known Sanrio characters, from Hello Kitty to Keroppi. 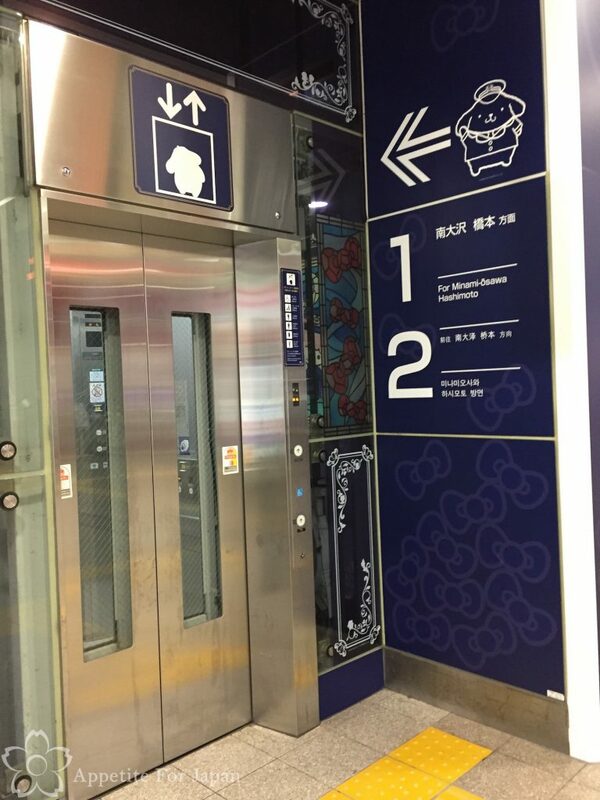 Above: I particularly like how Pompompurin is even featured in the sign indicating the lift. 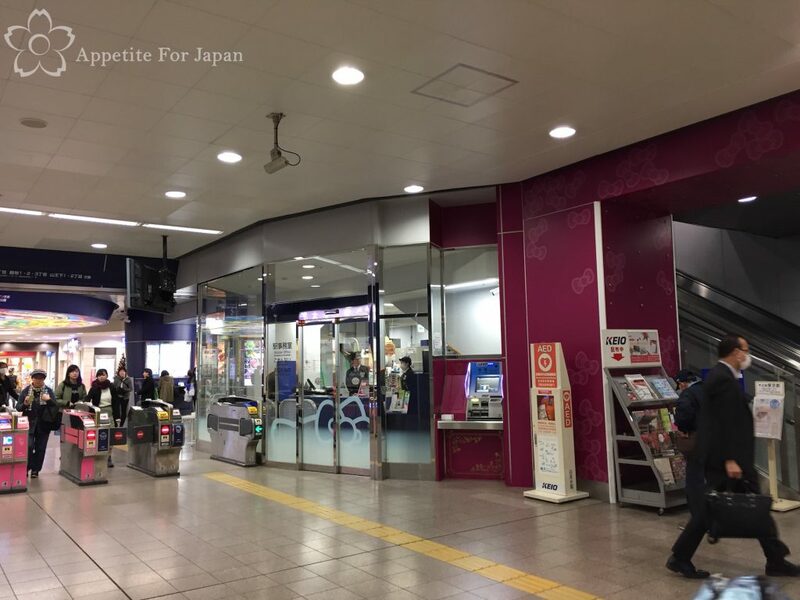 Above: Even the station office has Hello Kitty bows on the outside, and if you look to the left of the photo, you’ll see that the ticket gates are pink (they also feature pictures of Sanrio characters). 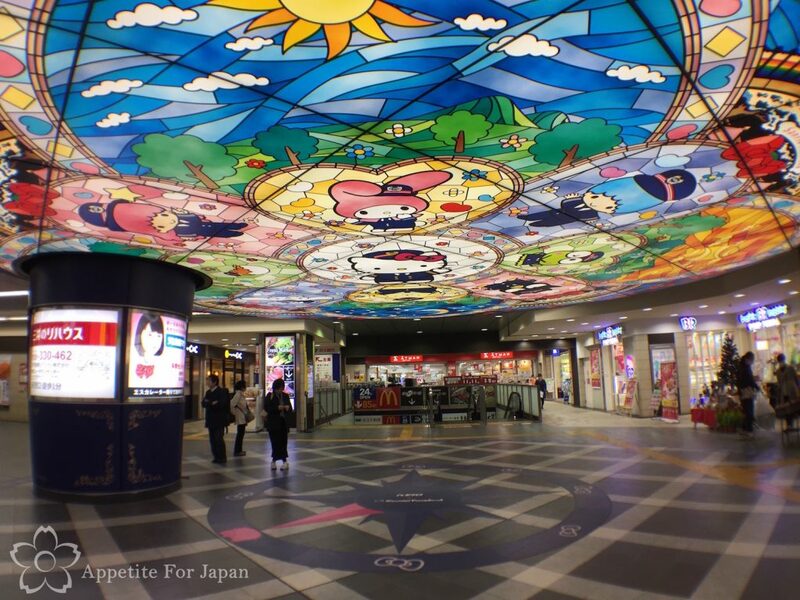 Above: My favourite part of Tama station is the huge faux-stained glass Sanrio ceiling just past the ticket gates. 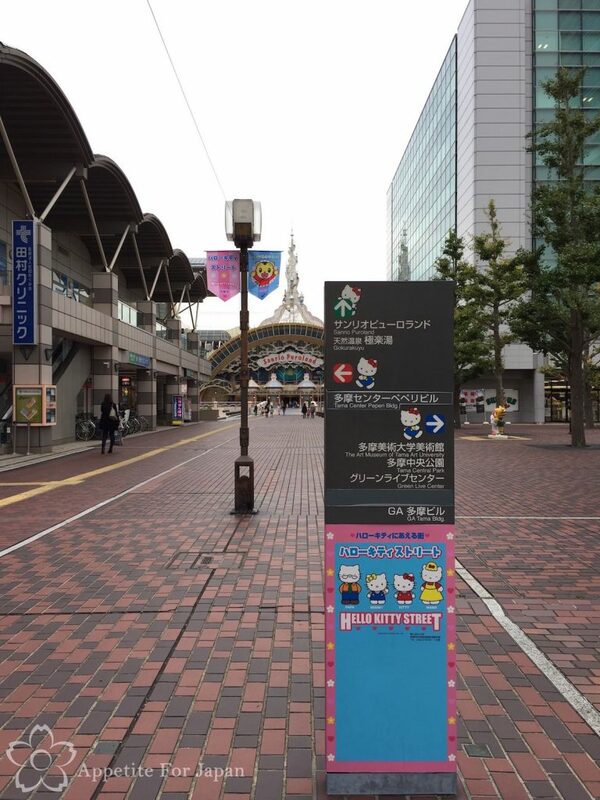 You can’t miss it, and on the ground is a compass indicating which direction to walk in toward Sanrio Puroland. Normally I’d leave directions to the end of the post, but since the Hello Kitty compass has pointed us in the direction of the theme park and there are a few more Sanrio things to look out for along the way, I’ll keep going. Above: Once you’ve followed the arrow in the compass at the station, you’ll have walked up some steps to exit the building. Keep walking straight ahead (you’ll come to some more steps after a little while – keep on going), and after a couple of minutes you’ll come to this area. When you see the orange building on the corner, turn left. Walk down the street that has the McDonald’s. 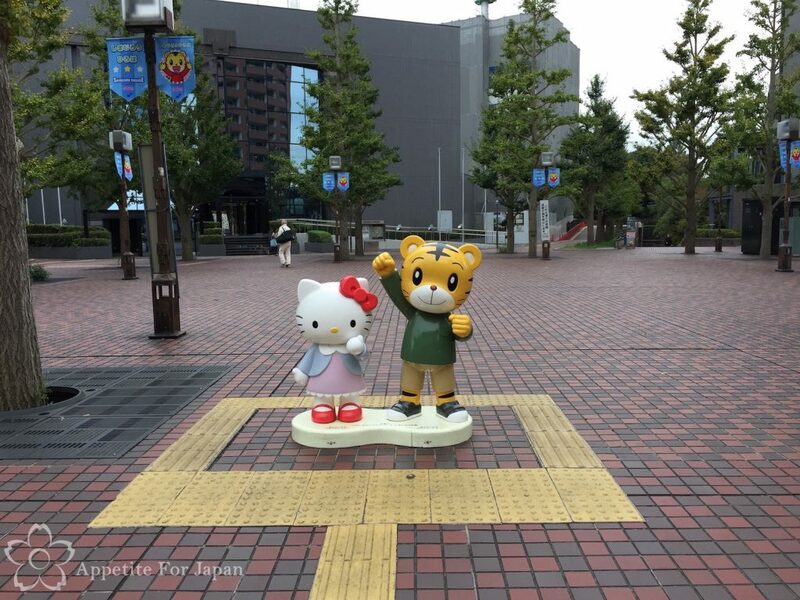 That’s right, you’re on Hello Kitty Street! That’s Sanrio Puroland in the distance. Above: Keep your eyes out for Sanrio characters. 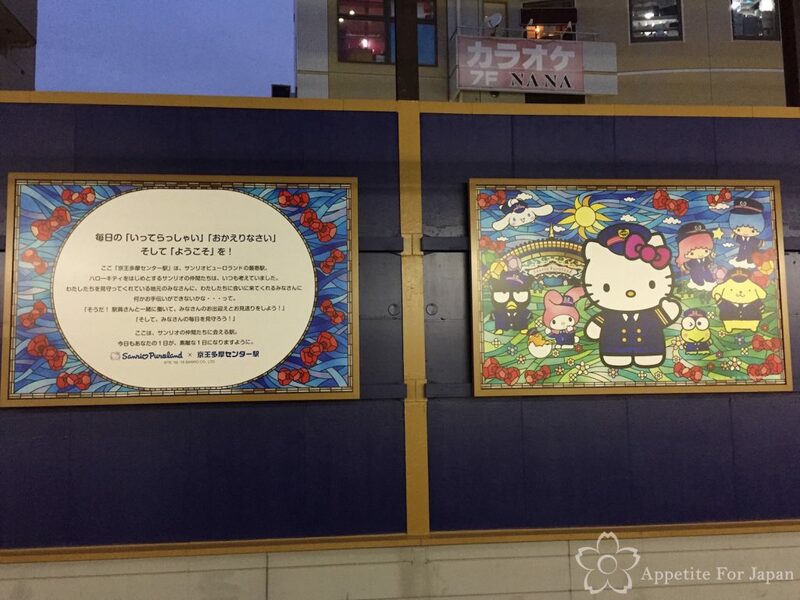 Above: And there it is – the entrance to Sanrio Puroland! 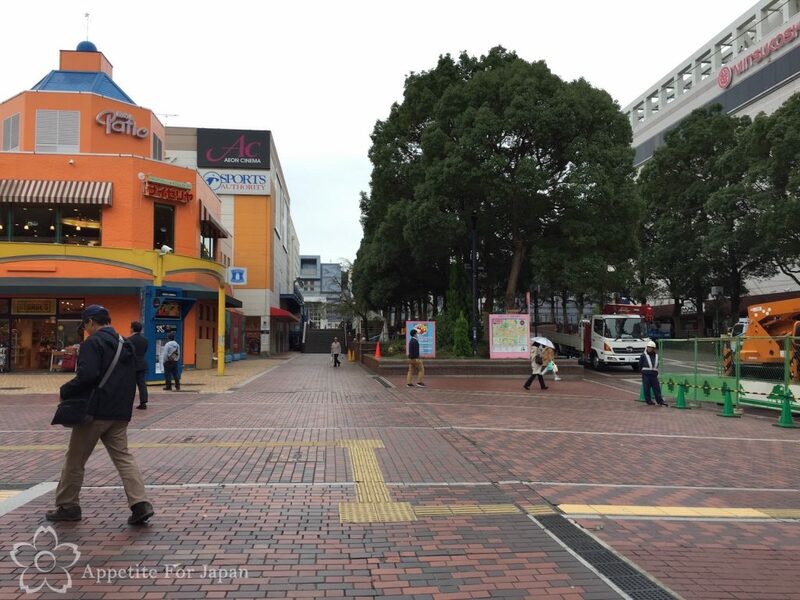 It takes about 5-10 minutes to walk there to Sanrio Puroland from Tama Station. Once you get there, you can purchase your tickets at the front. Ticket prices vary depending on the time of the day, and whether or not you have a discount coupon. You can generally get discount coupons for Sanrio Puroland on their website, so it’s worth checking this out before you go. We printed ours out and brought it with us. 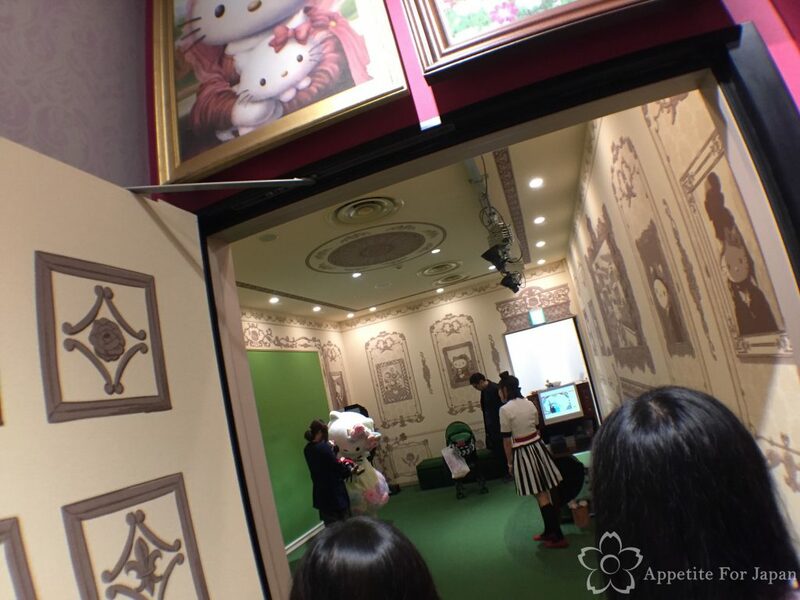 Sanrio Puroland is an indoor theme park, so yes, it’s entirely indoors. There are stairs and escalators to move between floors, and there are four floors altogether. It’s not that big, but it does get a bit confusing. You’ll get a map as you enter, so hang onto it. 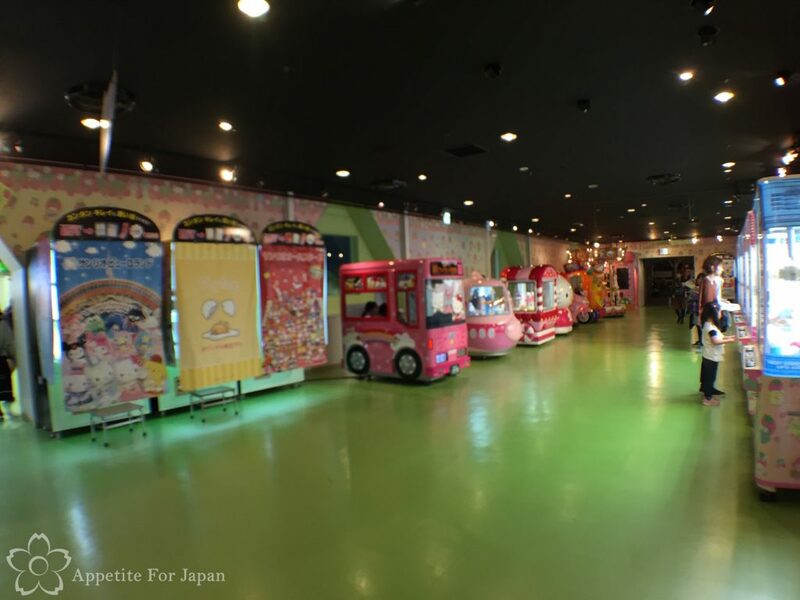 The second floor includes Game Corner, kind of a game arcade, as well as a couple of rides and the entrance to Lady Kitty House (Hello Kitty’s house). Game Corner features a lot of UFO catchers and some purikura (photo booth) machines – all very overpriced, of course. 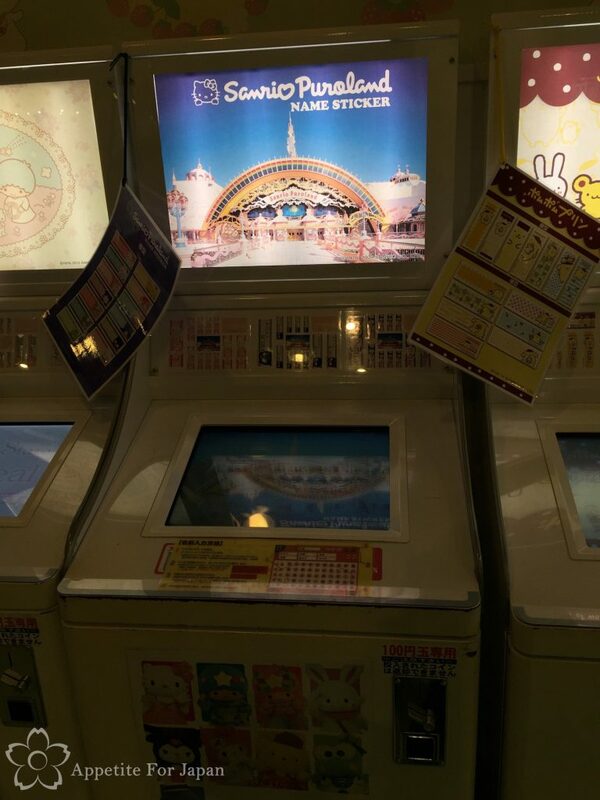 Above: There are some machines that let you print your own name stickers featuring Sanrio characters. These make a good, personalised souvenir. At various points during the day, there are shows. Note the fairies in maid costumes – only in Japan! 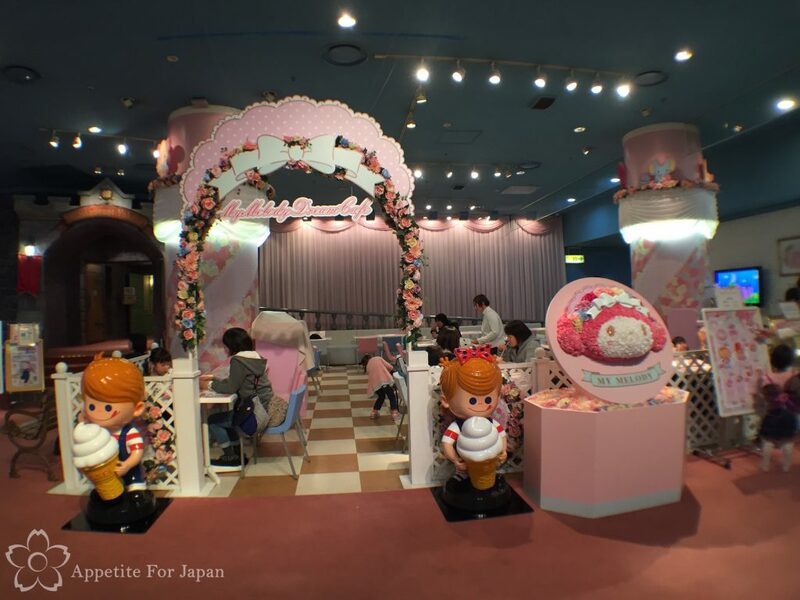 There are only a few rides at Sanrio Puroland, all of which are very tame which makes them suitable for both children and any adults who aren’t major thrill seekers (my partner and I fit firmly into the non-thrillseeking category, so this worked for us). If you’ve been to Tokyo Disneyland, these are comparable to the It’s A Small World Ride, but (thankfully) they don’t last as long. Oh, and they feature photo opportunities! One of the rides only takes one photo of you, and my partner and I didn’t realise that it was about to take the photo of us until it was too late. At the end of the ride, you have to pass by the desk where you can buy the photo for some ridiculous price. Our photo was of the backs of our heads. It was so funny that we were tempted to buy the photo… but it just wasn’t worth the price (and wouldn’t have been even if you could have seen our faces). Another ride provided about six photo opportunities, and at the end you could select your three favourite photos and decorate them, a little like you’d do in a purikura session, but of course much more expensive. For all the opportunities to spend money, I should point out that the rides themselves are free (well, included in your ticket purchase), so you can spend all day on the rides if you desire, and it won’t cost you any extra (unless you want to purchase all of the photos!). Around the theme park there are some random displays. Honestly, I’m not really sure what these were for. I felt like they were just trying to fill the space. 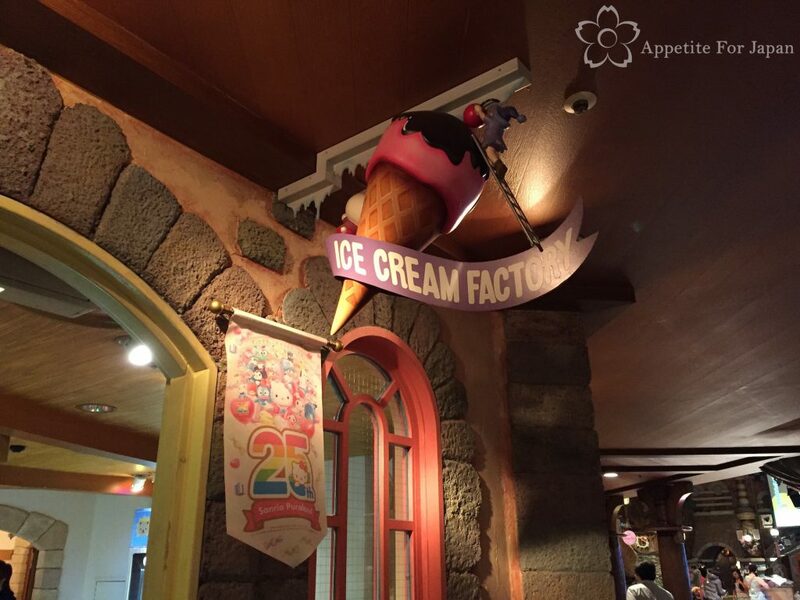 Above: I got a little excited when I saw a sign for an Ice Cream Factory. 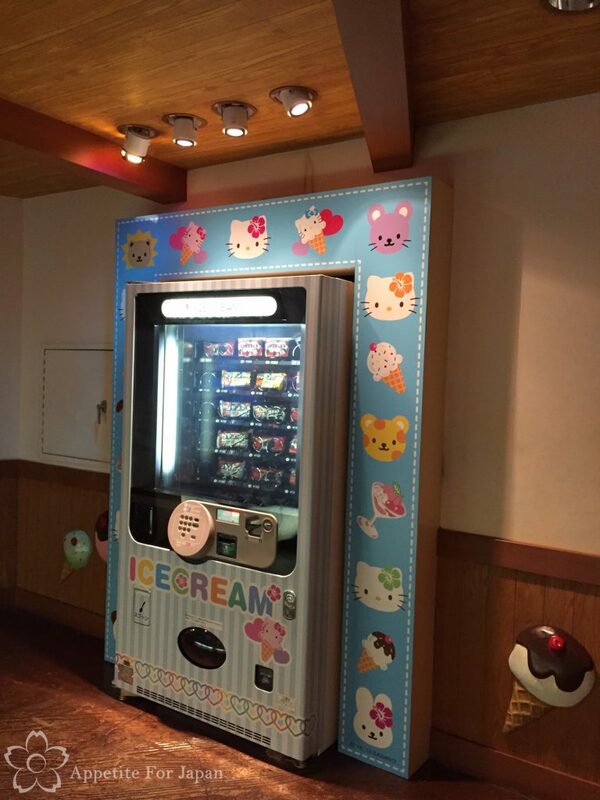 Above: Alas, upon entering the Ice Cream Factory, it was just an empty room with an ice-cream vending machine. 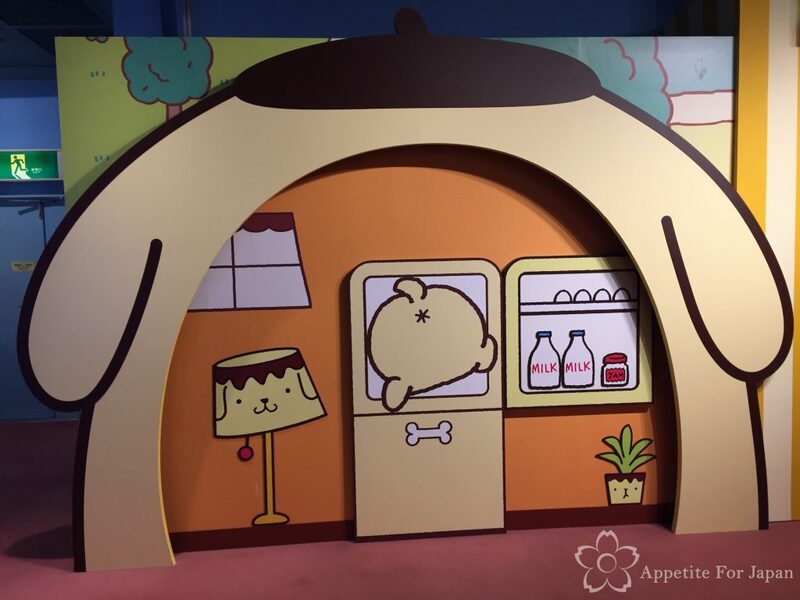 The main characters featured throughout Sanrio Puroland are Hello Kitty, My Melody and Pompompurin (pictured above and… his behind pictured below). If you like these characters, you’ll be happy to find plenty of things to see and take photos of/with around the park. 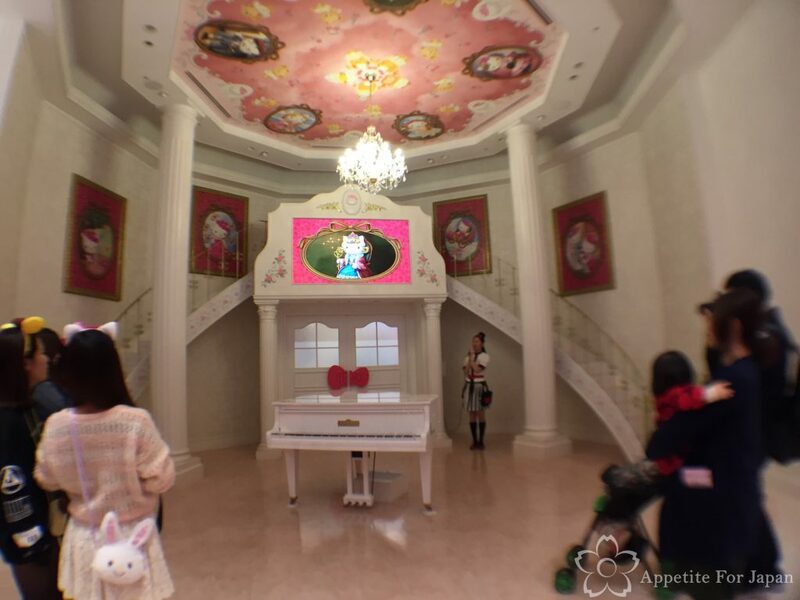 Above: Whilst Hello Kitty’s house is considered the main attraction at Sanrio Puroland, I have to say that – although it was only one room – I thought My Melody’s bedroom was better. For starters, it actually looked kind of like a real bedroom. We’ll get to Hello Kitty’s house later. 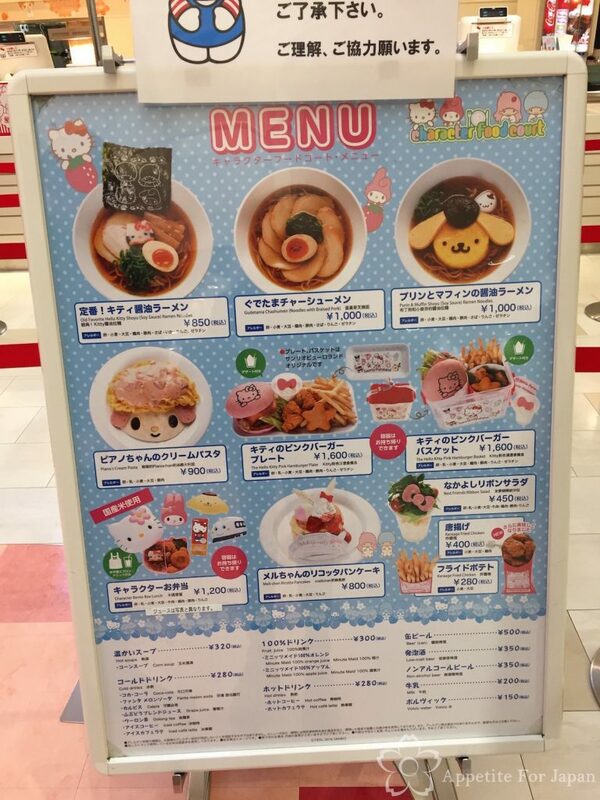 If you’re anything like me, you’ll be wondering what the food options are at Sanrio Puroland. 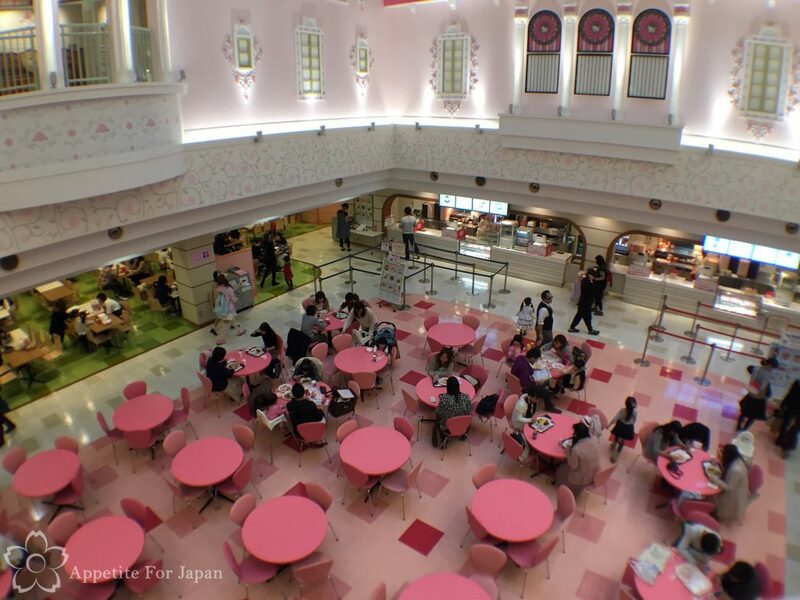 If, like me, you’re also used to Tokyo Disneyland, you’re going to need to prepare yourself for the fact that there aren’t as many eateries at Sanrio Puroland. 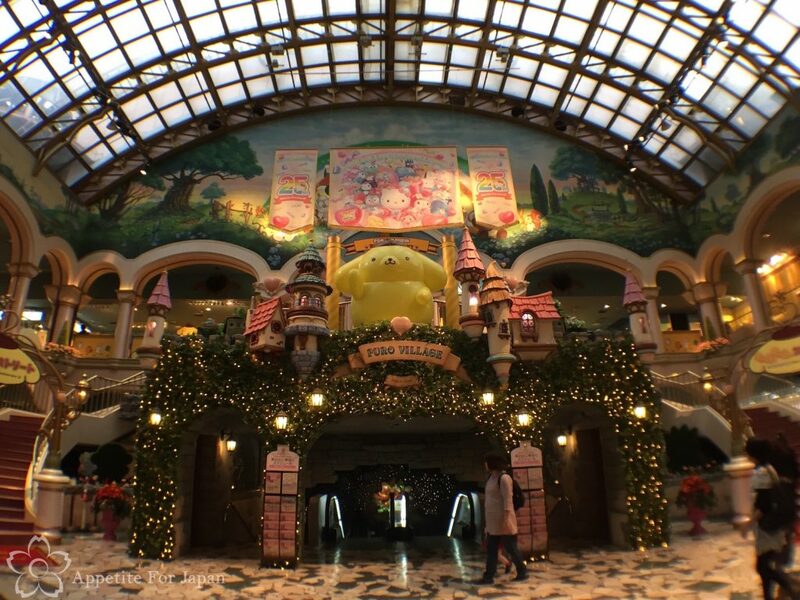 After all, Sanrio Puroland is only a fraction of the size of Tokyo Disneyland. 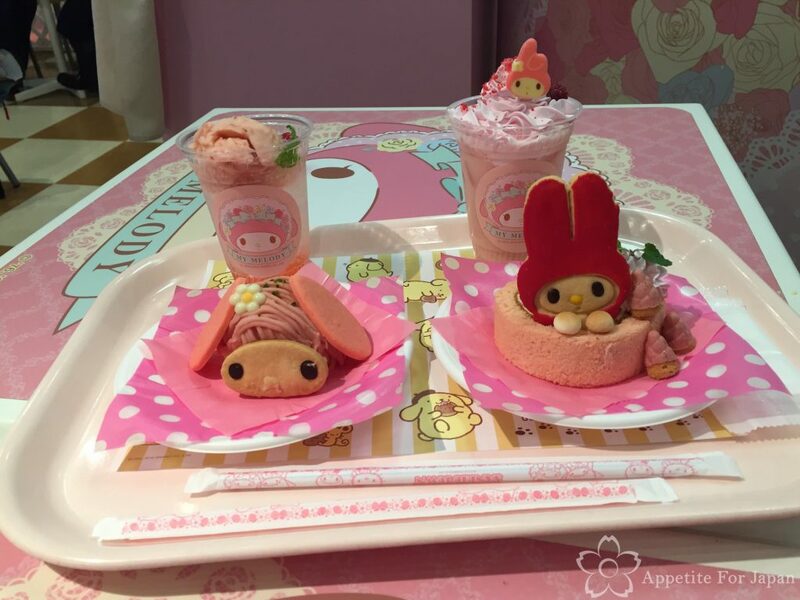 Sanriotown Character Food Court, has some savoury meals and a couple of token desserts. 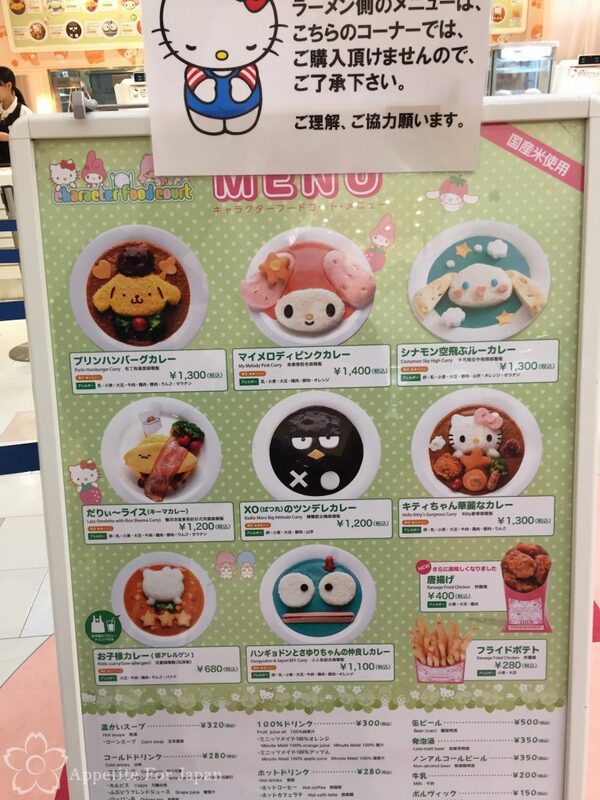 These include kawaii looking character-themed curries in various colours (including pink and blue! ), hamburgers, ramen and more. 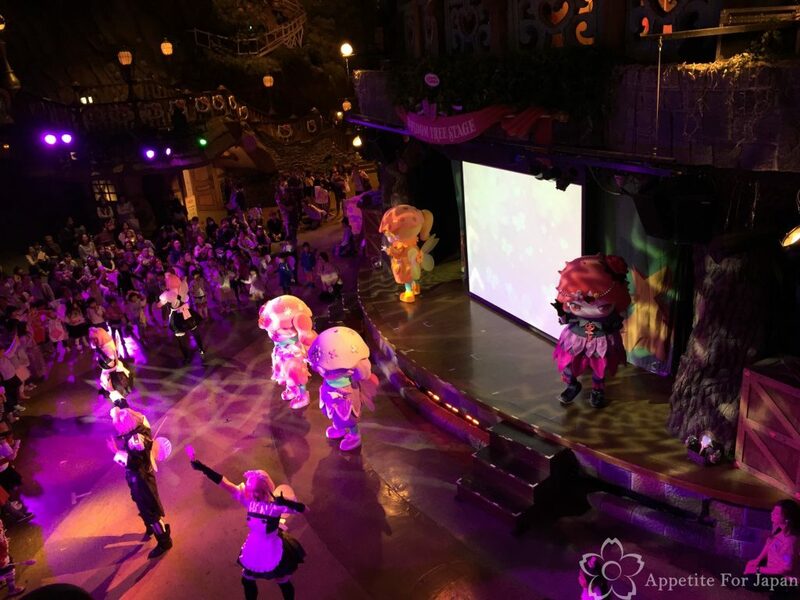 You can find the Sanriotown Character Food Court menu here. 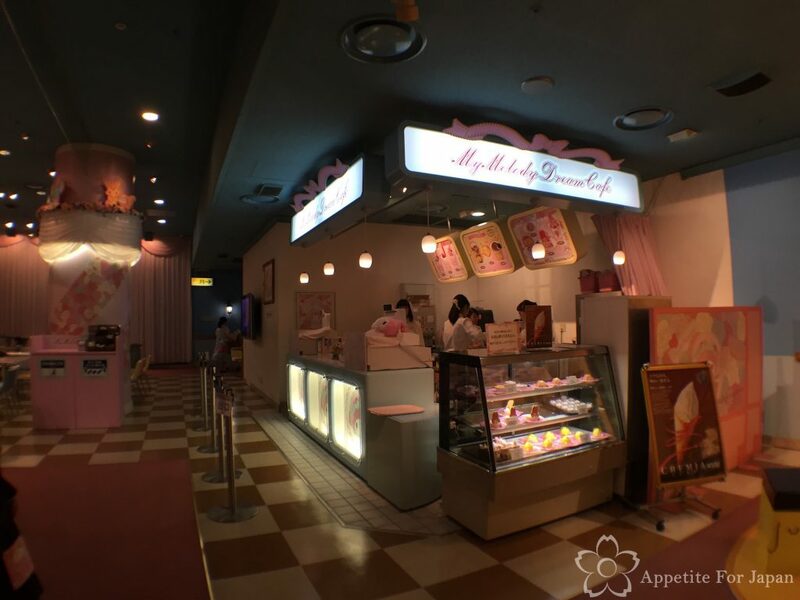 If you’re into kawaii (cute) food, then you’ll probably want to check out My Melody Dream Cafe. 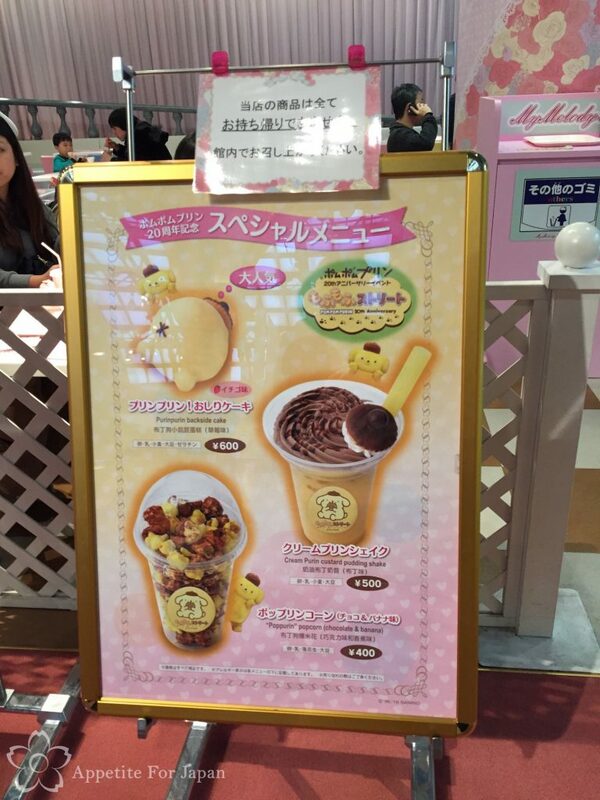 This is a small, counter-service cafe where you can purchase a dessert and a drink and then sit down and eat it. We had a strange experience where there was nobody in the queue, so we walked straight through to the counter as the girl made eye contact and acknowledged us. As we reached the counter, she then made us go back to the part where you queue up, made us stand there for about 10 seconds, and then called us back to the counter. They love their rules in Japan, even when it’s illogical to follow them! Above: My Melody Dream Cafe only has a very small selection of sweets, but they are pretty cute. 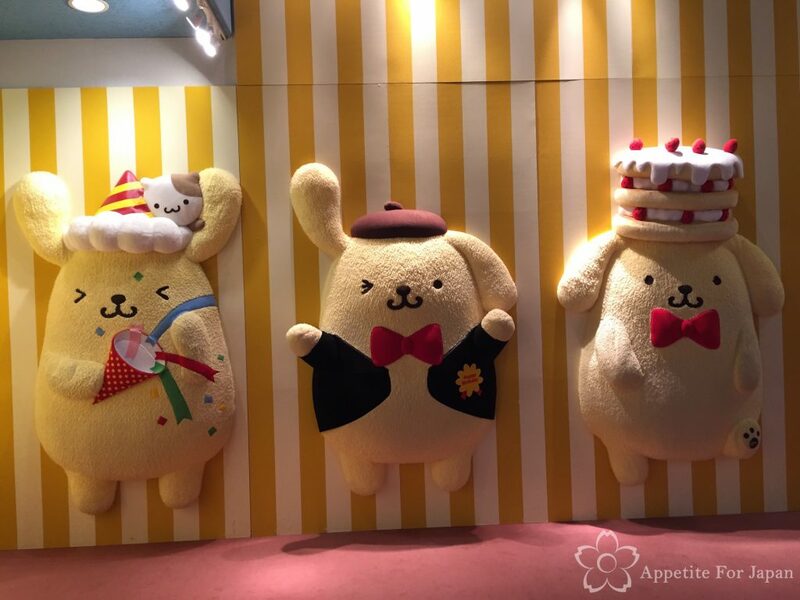 The Pompompurin Backside Cakes are hilarious and I kind of regret not choosing one of those! At around 600 Yen each, the sweets aren’t cheap, but Sanrio Puroland is a theme park, so you can expect to pay theme park prices. 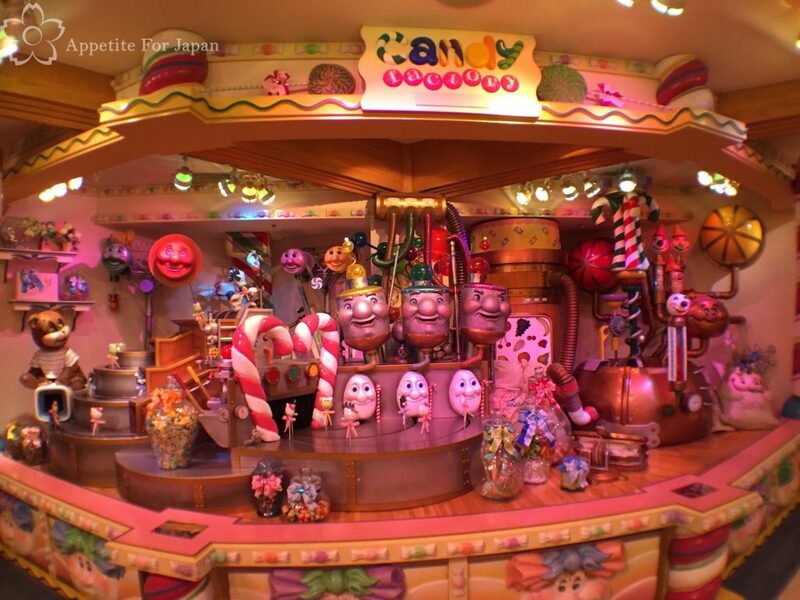 According to the website, other restaurants at Sanrio Puroland include Sanrio Rainbow World Restaurant, Restaurant Yakata and Sweet Parlor, but we could not for the life of us find anything other than Sanriotown and My Melody Dream Cafe, and asking staff for help didn’t get us any further. 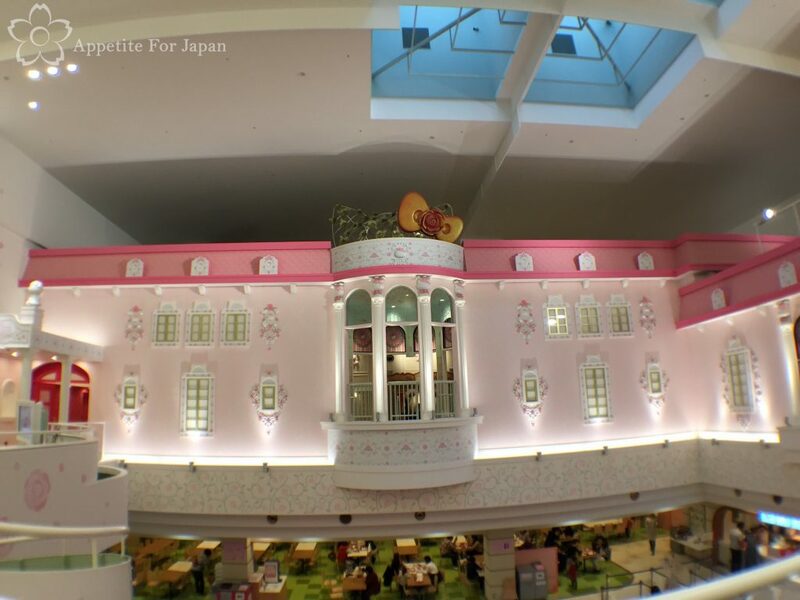 There are six shops at Sanrio Puroland. I don’t think I need to go into any detail about what they sell, as that’s pretty obvious (yes, Sanrio merchandise, and lots of it). 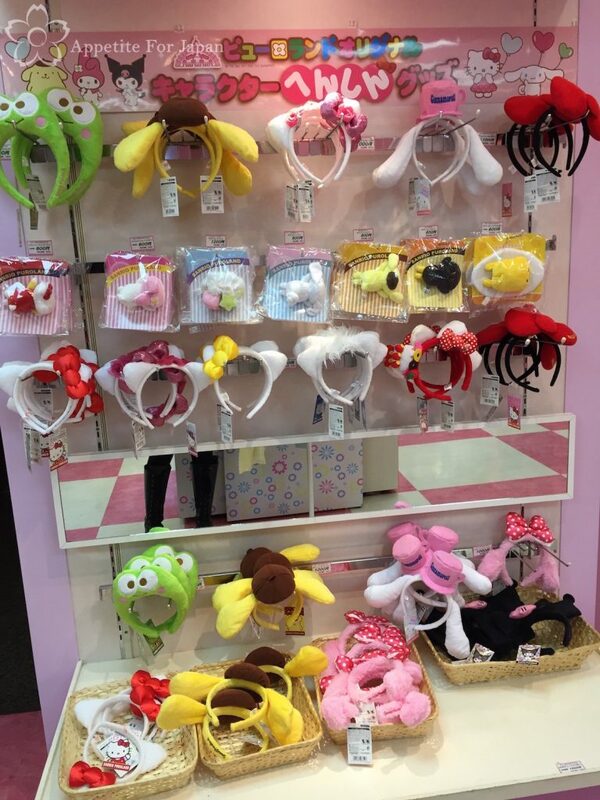 Something that I did find interesting is that they sell quite a few different sets of ears (headbands with the ears of the characters), similar to what you’d get with the Mickey Mouse ears at Tokyo Disneyland. Unlike Tokyo Disneyland, though, you don’t see many people wearing these around Sanrio Puroland – I don’t think the idea has quite caught on there. 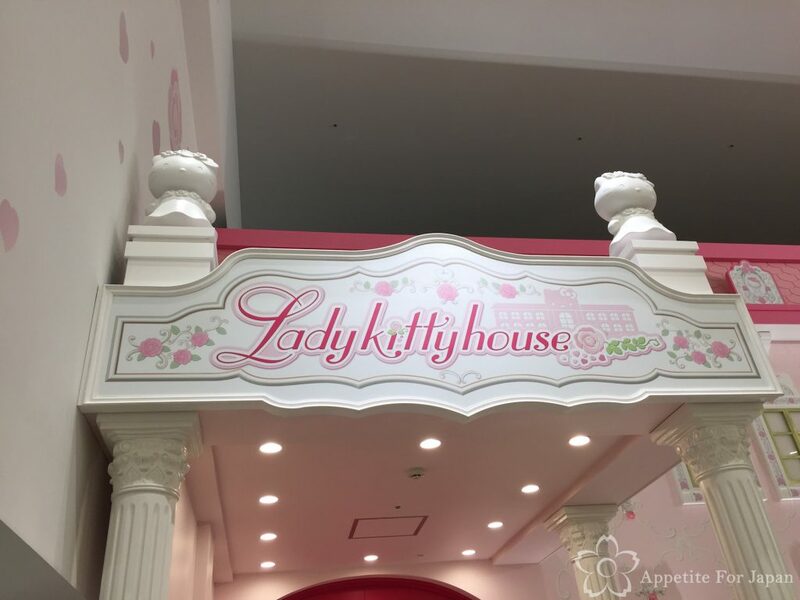 Being the most popular attraction at Sanrio Puroland, the line for Lady Kitty House can be quite long. They have a sign with an estimate for the wait time, so take note of this before you step into the line. I think we waited around 20 minutes, as the line was not very long. They only let a small number of people in at a time – probably around 20 or so. The first thing you’ll see when you enter Lady Kitty’s House is a plastic couch and big framed pictures of her (I think the one in this photo must have been leftover from Halloween). Above: Wait, no, THIS is what you’ll really see. Poorly disciplined children and their equally poorly disciplined parents will literally dive toward Lady Kitty’s couch with no care for anything or anyone around them, hungry for endless photos. Wow. Next up, you’ll watch a video in which Lady Kitty welcomes you into her home, and the guide will also say a few words. Above: The poor guide who led us into Lady Kitty House was trying to speak to the audience while a group of children banged on the piano in the middle of the room and generally caused all kinds of chaos. I felt kind of bad for her, but she took it in her stride. 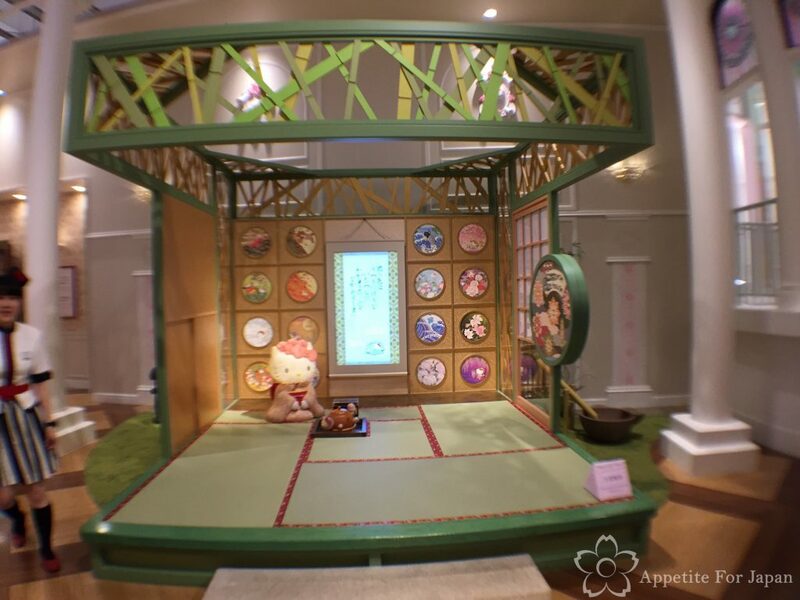 The next room is basically a bunch of photo opportunities, such as a traditional tea ceremony scene (you have to take of your shoes for this one). Expect to wait some time while the aforementioned out-of-control families push in and take their sweet time. Above: This is Lady Kitty’s bed. It’s completely made of plastic, because we all know that children will climb all over it with their shoes on. Again, if you want a picture here, be prepared to wait for said children to finish putting their dirty shoes all over it. Above: You can’t leave Lady Kitty’s house without stopping for a photo with her. No really, you actually have to line up and take the photo before you can exit (via another gift shop, of course!). Once you’ve finished posing for photos in Lady Kitty’s house – or trying to avoid the out-of-control families until you can’t take it any longer – you must queue up for your obligatory photo. While we waited in line, a child threw up on Lady Kitty who had to dash off for 10 minutes before returning in a new, clean dress. I mean, that’s all part of the experience, right? 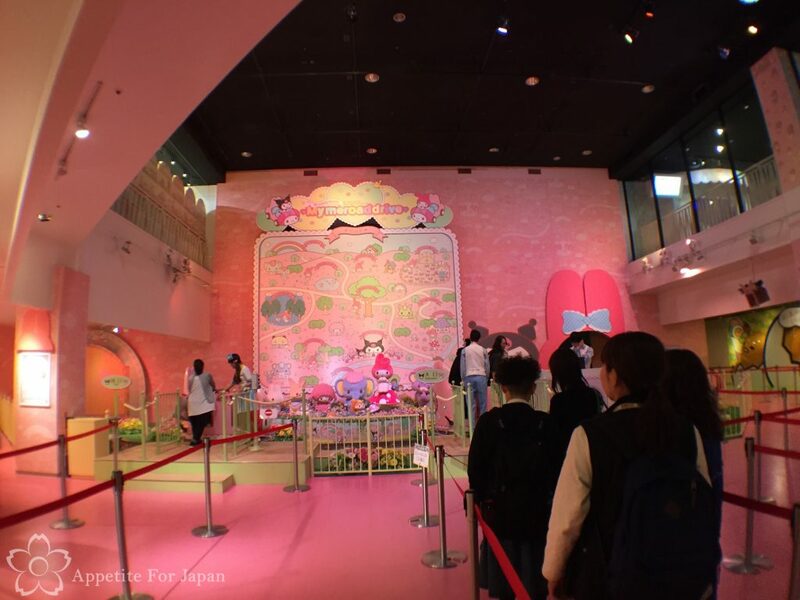 How much do Sanrio Puroland tickets cost? 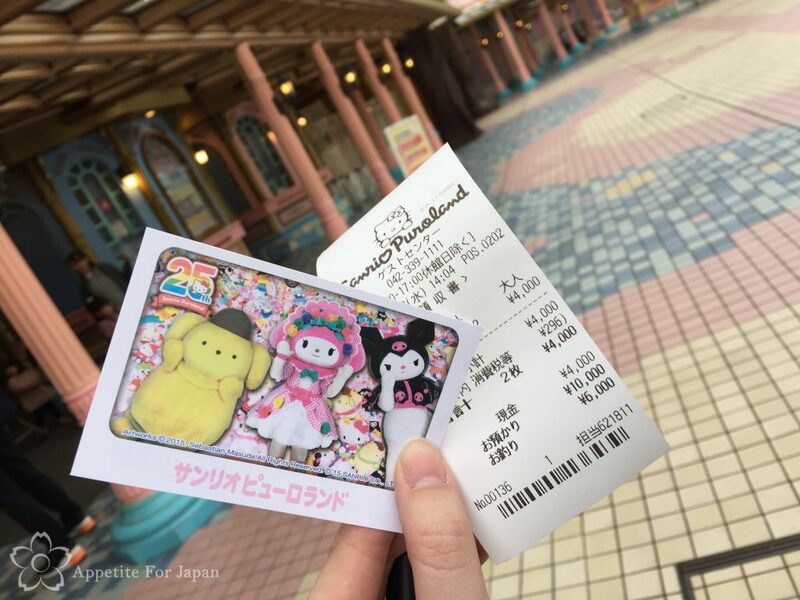 Full price tickets for Sanrio Puroland cost 3,300 Yen for adults and 2,500 Yen for children on weekdays. On weekends, public holidays and school holidays, they cost 3,800 Yen for adults and 2,700 Yen for children. 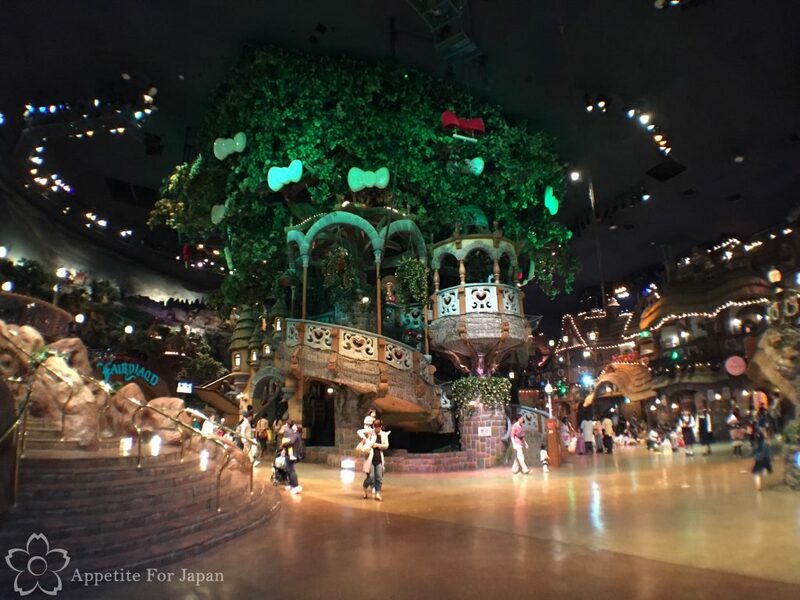 For cheaper tickets, consider going during the afternoon (after 2pm on weekdays, after 3pm on other days) when tickets are only 2,000 Yen for adults and 1,700 Yen for children. We bought ‘Afternoon Passports’ and found that we had more than enough time to do everything we wanted to do. If you’re travelling with children and/or want to do absolutely all the activities, you might want more time – the park is generally open from 10am until 5pm or 6pm. 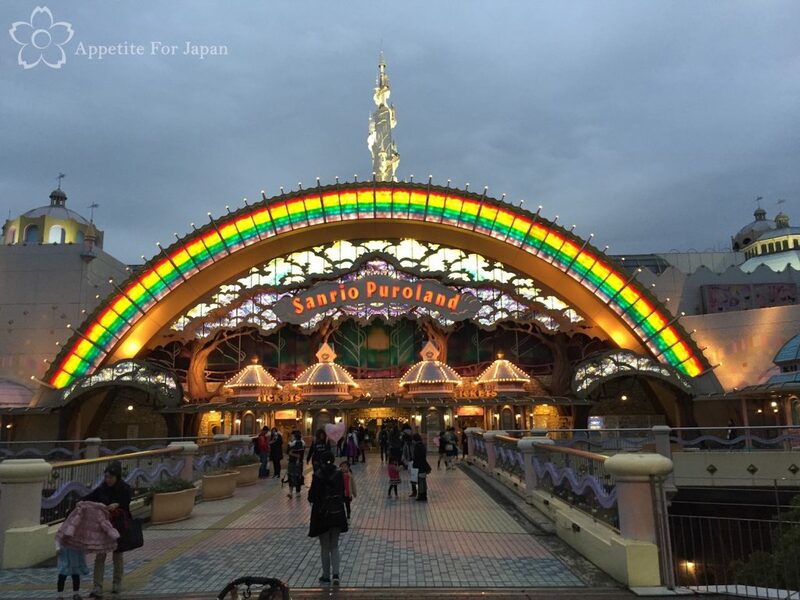 Discount coupons for Sanrio Puroland can be found on the Sanrio Puroland website. 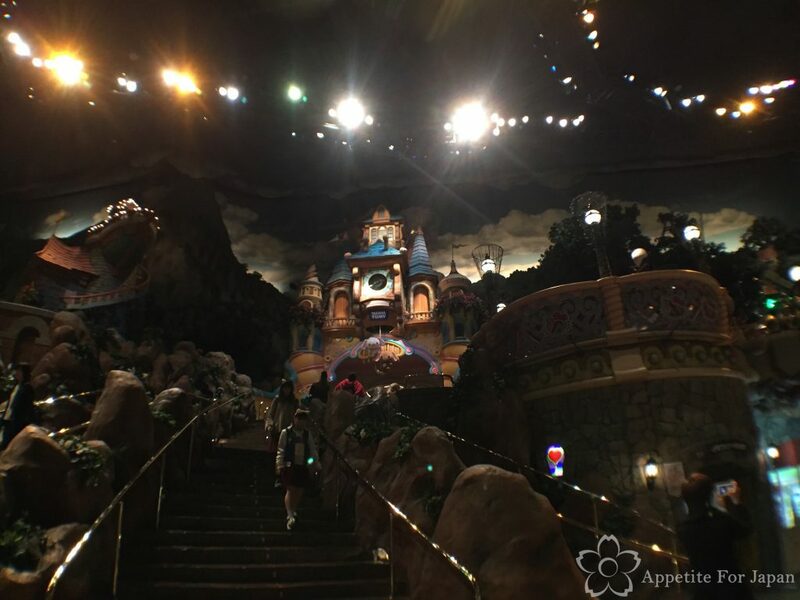 Note: I highly recommend that you check the Operation Schedule prior to visiting to ensure that the park is open (Sanrio Puroland is closed some days, often on Wednesdays and Thursdays), and to confirm the open hours as these do change from day to day. Oh, and in case you’re wondering, Sanrio Puroland has free WiFi. Would I recommend Sanrio Puroland? 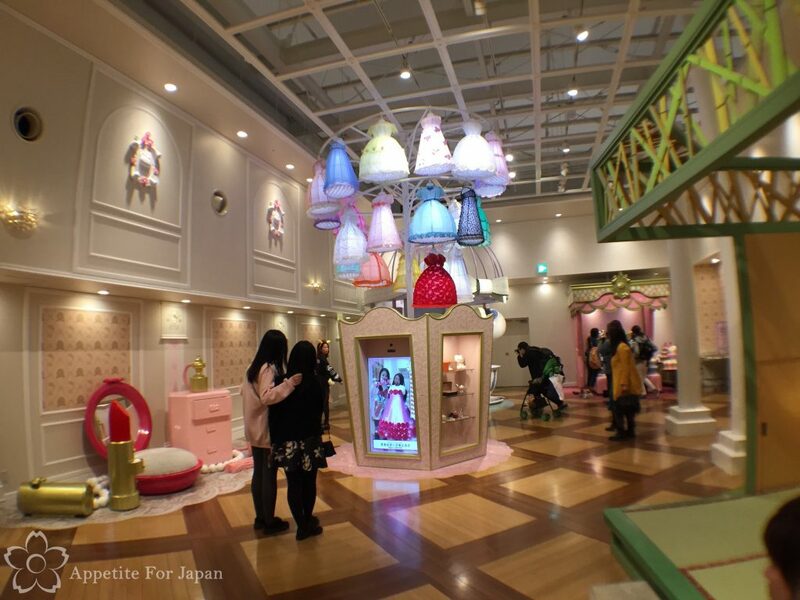 Otherwise, I’m going to suggest that you strongly consider whether you really want to visit Sanrio Puroland. 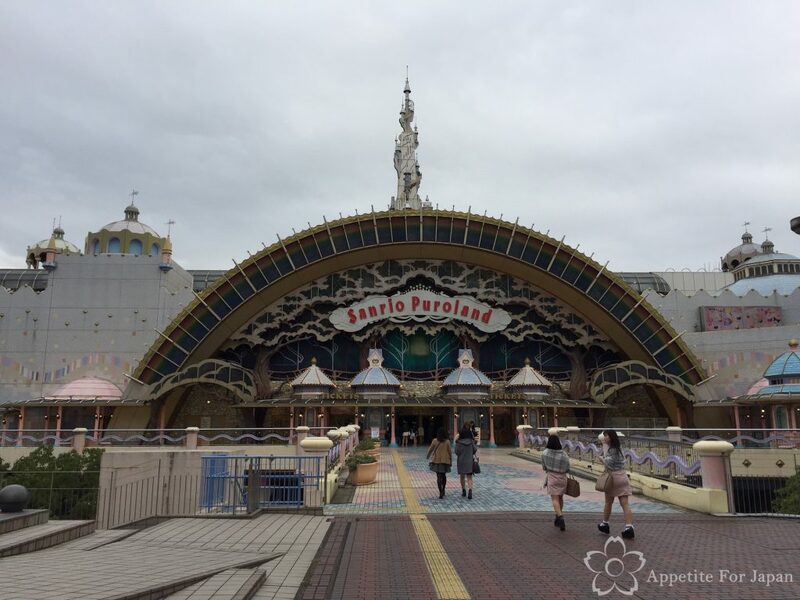 If, after reading this post, looking at the photos and also reading my warning, you’re still keen, then by all means pay Sanrio Puroland a visit. But consider yourself warned! 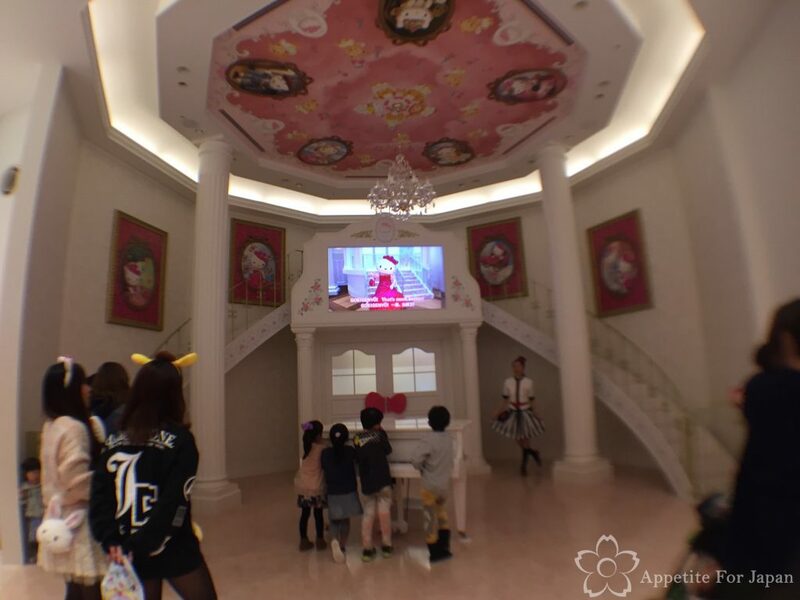 In all seriousness (as if what I just wrote wasn’t serious enough), most of the people visiting Sanrio Puroland when we went were families with young children. 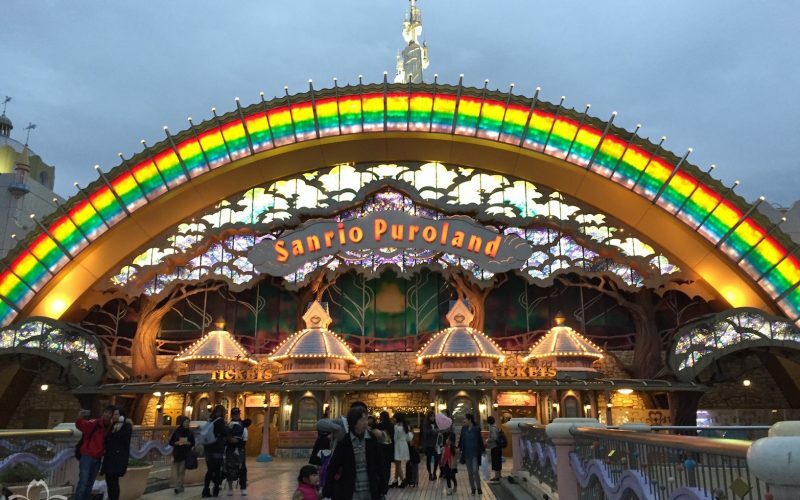 If you really, really love Hello Kitty/Sanrio, then you might still enjoy it, but unlike Tokyo Disneyland, Sanrio Puroland isn’t for everyone. Funnily enough, what I liked most about visiting Sanrio Puroland was actually Tama Station. 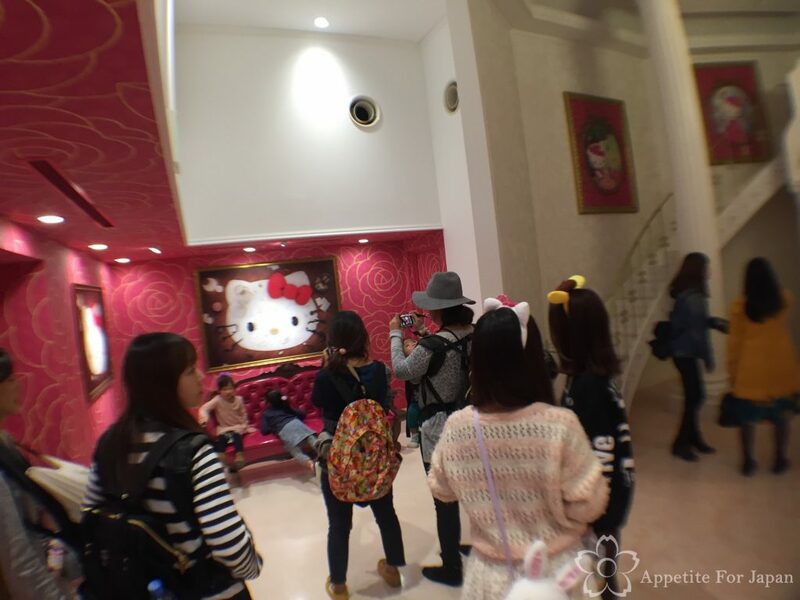 I loved how it was totally decked out with Sanrio characters. I come from Australia and you’d never see a train station like that here! Should I go to Sanrio Puroland or Tokyo Disneyland? Is that a real question? Tokyo Disneyland, of course! Or Tokyo DisneySea – or both. Yes, the Disney parks cost more, but I have yet to find a theme park that I would recommend over Tokyo Disney Resort. 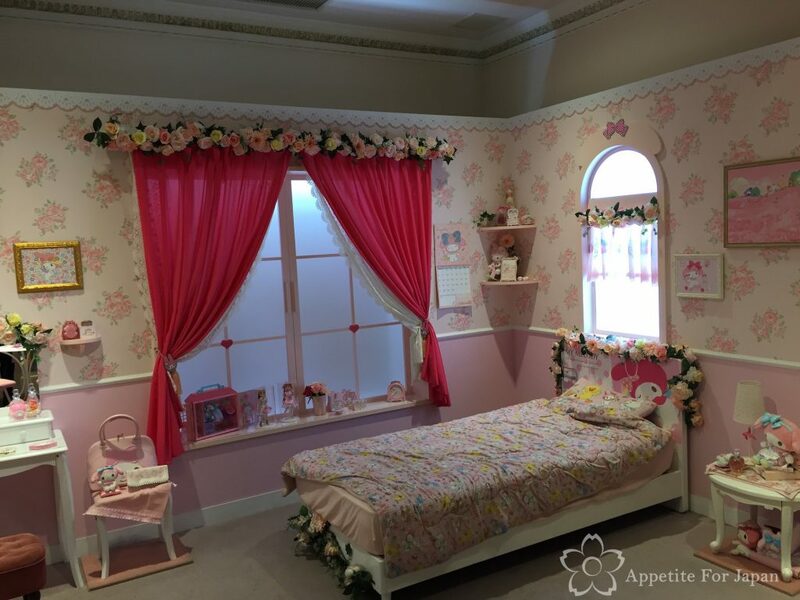 If you want to turn your Sanrio Puroland trip into the ultimate Hello Kitty adventure, you might want to consider spending a night in one of the Hello Kitty themed hotel rooms at nearby Keio Plaza Hotel Tama. 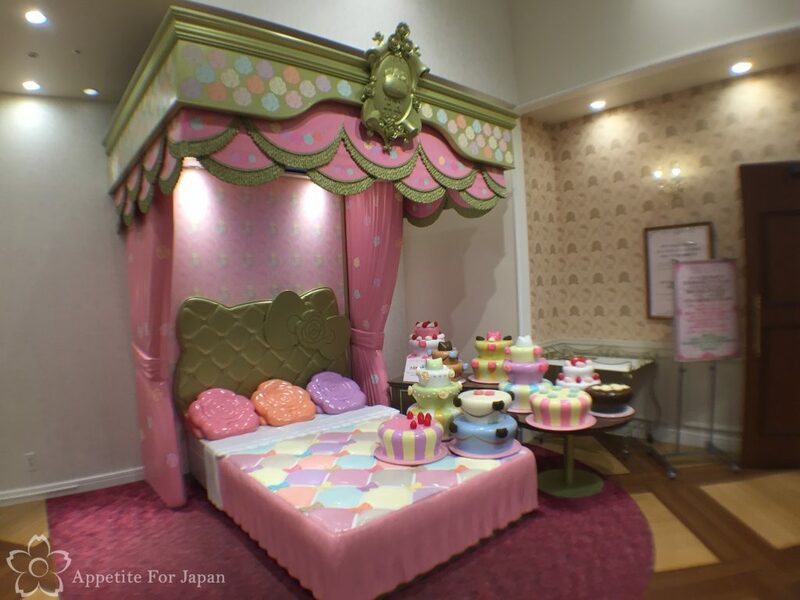 Not only will that save you taking two long train trips in one day, but the Hello Kitty hotel rooms are super kawaii. 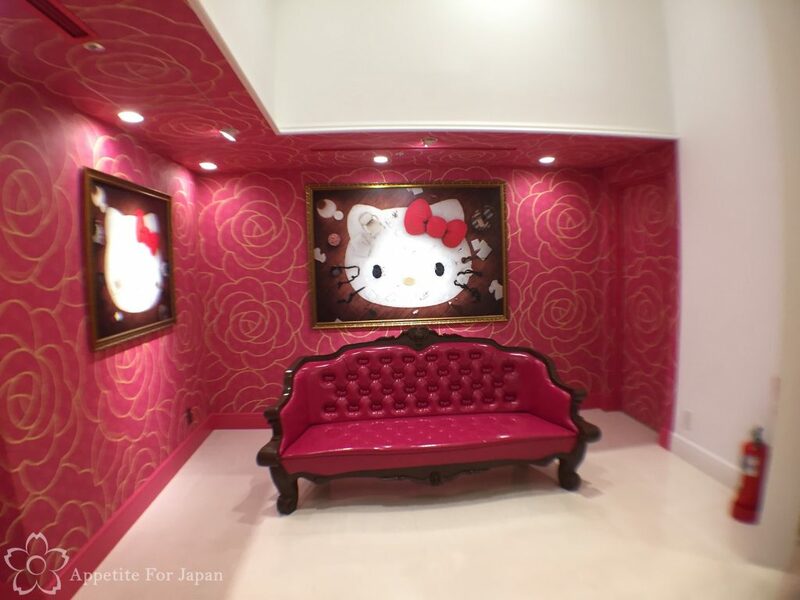 Or, if you don’t want to stay in Tama but you want to stay in an incredible, kawaii Hello Kitty hotel room, check out my post on the Princess Kitty room at Keio Plaza Tokyo (if you love Hello Kitty, you’ll love this)! 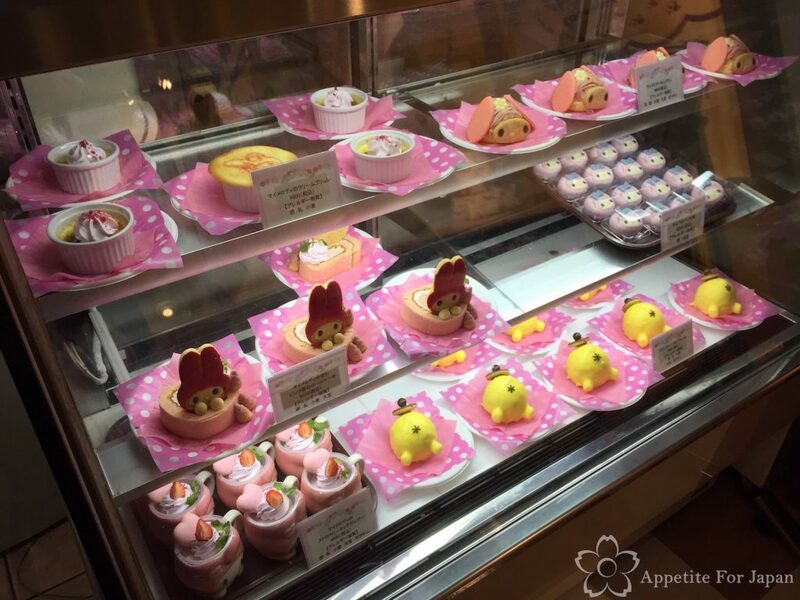 In the next post we’ll get a further taste for Sanrio at the Pompompurin Cafe in Harajuku (see what I did there? ).